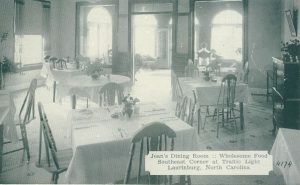 Learn about the City of Laurinburg NC, history, lifestyle and more! Opportunities abound for civic involvement and other activities. With over six civic clubs, there are plenty of activities with which to become involved. From the mild climate to the many local attractions, it’s easy to see why so many people choose to call Laurinburg “home”. Mr. Washington Gill was the mayor of the new town. His home has been preserved and restored. It was also the home of Edwin Gill, long-time Treasurer of North Carolina. The Laurinburgh High School stood along what is now Caledonia Road, north of the Church Street intersection. Some of the older houses along this road were made from parts of the school buildings after they were no longer in use. One of these houses was the boyhood home of Terry Sanford, who served as both Governor of North Carolina and as United States Senator. Of course, this was many years after the days of the Laurinburgh High School. Incidentally, the home in which Mr. Sanford was born has been torn down. It stood on West Church Street. Laurinburg is said to have had its beginning with the store and blacksmith shop, which were near where our older water tank now stands. This is very near the site of the high school mentioned earlier. Another point of interest in Laurinburg is the county’s new courthouse, built in 1964. The county’s first courthouse was built in 1901, facing Main Street where the A. B. Gibson Education Center now stands. Court was first held in a rented building, and Judge Walter Neal, whose picture now hangs in the Courtroom, held the first term of criminal court in the county the week of November 18, 1901. On the grounds of the new courthouse are two monuments of historical interest, which were moved from the old courthouse grounds. The Confederate Monument is typical of many erected in the South in the years following the Civil War. Public subscriptions were taken for it, and it was originally placed in the center of the street at the intersection of Church and Main Streets. As automobiles became more common, it proved to be quite a traffic hazard and was moved to the courthouse grounds. The Quakenbush Monument honors William Graham Quakenbush, who was principal of Laurinburgh High School from 1879 to 1900. In fact, the school was locally known as “The Quakenbush School.” Mr. Quakenbush was not only a beloved educator, but he was also one of the leaders in the movement to form Scotland County. North Carolina’s Education Governor, Charles B. Aycock, spoke at the dedication of the monument. Recently, a monument has been erected to honor local veterans of all wars. The stores along the main street were operated by some of the town’s most prominent citizens. Mr. John F. McNair started his business at Springfield and Laurel Hill, and later moved it to Laurinburg’s Main Street in 1872. Mr. McNair was a prominent businessman with far-reaching interests in land, textiles, banking and other enterprises. Mr. Walter Evans, a black man, was another important Main Street merchant. He opened a clothing store, which specialized in good quality shoes. Mr. Evans was also a highly respected businessman with holdings in land and other property. 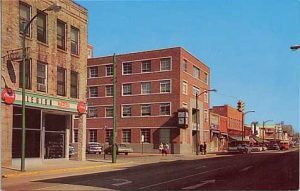 The Everett Brothers and Gill Store was one of the most prosperous on Main Street. Everington’s Drug Store is also one of the older Main Street businesses, started in 1882. Laurinburg’s Main Street even boasted an opera house. The upstairs of the building at the corner of Main and Roper Streets was used for traveling shows and for community events, and was known as The Opera House. Fortunately, soon after the shops left, the textile industry started to move into the town. 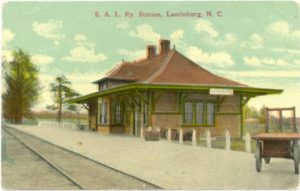 The railroad shops were instrumental in bringing prosperity and economic activity to help Laurinburg get started. The railroad continued to be an important part of the community. 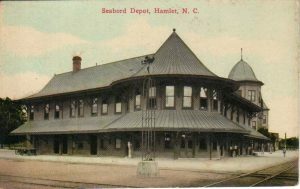 In the first half of the century, hundreds of car loads of cantaloupes and watermelons were shipped by rail from Laurinburg and the surrounding towns. In fact, Laurinburg called itself The Capital of the Cantaloupe World. Laurinburg received a good deal of national attention some years ago with the story of Cancetto Farmica, known locally as “Spaghetti.” Farmica, a carnival worker, was killed in 1911. The family never came to claim the body, and it was held by a local funeral home until it was buried in 1972. During the years, the body became a kind of tourist attraction. To the east of Laurinburg proper is East Laurinburg. It was to East Laurinburg that the textile industry came. It was in the last days of the 19th century that the Waverly Mills operation began with the building of its first plant, Scotland Mill. The town of East Laurinburg is composed almost entirely of the villages, which were built around the textile plants. East Laurinburg is an incorporated town, legally separate from Laurinburg. The oldest church in Laurinburg is the Laurinburg Presbyterian on West Church Street, an off-shoot of the Old Laurel Hill Presbyterian Church. This church was organized in 1859 and constructed a building in 1866 on the site of the present-day church. Many of the early settlers were Scots and Presbyterian, and there has been a strong Presbyterian influence in the community. Laurinburg’s oldest public school is Central School (now closed). Built in 1909, it served as the only school for some years, containing both elementary and high school classes. Central School is no longer used as a school, but has been converted into elderly apartments. 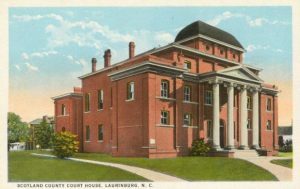 The Laurinburg High School, a part of the public school system, was built on East Church Street in 1924 and was used as a high school until the building of Scotland High School. It was then used as a junior high school until it burned in 1973. In the northern part of town are two other schools of much historic interest. Laurinburg Institute is the county’s oldest private school. This school, in its present location on McGirt’s Bridge Road and in its former location in the Newtown section, has served several generations of black students. It was founded in 1904 by Mr. E. M. McDuffie and is still operated by the McDuffie family. For many years this was the only school in town for black students, and at one time it operated as both a public and a private school. One interesting feature of the Institute in earlier days was the hospital, operated as a part of the school by Dr. N. E. Jackson. The school now operates as a preparatory school and has a long list of well-known graduates. 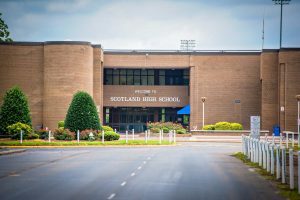 I. Ellis Johnson School was the black high school until the building of Scotland High School and the simultaneous integration and consolidation of all county schools. The school was named for Mr. I. Ellis Johnson, a long-time educational leader in the county and the first principal of the school. It is fitting that we started and ended our imaginary tour of Laurinburg with schools. The town grew up around and school and actually derived its name from that school. It is also fitting that we begin our imaginary tour of the rest of the county with a school. Let us move to the south of Laurinburg and begin our tour of the county at St. Andrews Presbyterian College. There is a legend to the effect that when the first Scottish settlers started moving up the Cape Fear River and inland from Wilmington, someone posted a sign which read, “The best land lies 100 miles west of here.” The story goes on that those who could read came to what is now Scotland County. This interest in things educational was rewarded in 1956 with the announcement that a new Presbyterian college was coming to the land of the Scots. Since its opening in 1961, St. Andrews has played a vital role in the life of the county. In September 1961, the first freshman class entered St. Andrews Presbyterian College. The campus, built on 800 acres just south of Laurinburg, boasted a contemporary architectural design. With the 70-acre lake as the focal point of the campus, the residence halls, athletic facilities, library and academic buildings included Celtic crosses as a unique design element. Ramps and electric doors were installed in the buildings, making St. Andrews one of the first colleges in the country to enable students with mobility difficulties to flourish at college. An innovative and bold academic venture to an interdisciplinary curriculum, a highly acclaimed college press, an award-winning pipe band, national champion equestrian teams, and first-rate scholarship have marked the distinctive character of St. Andrews. 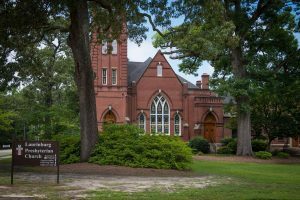 Bringing more than 10,000 students from around the country and world to Laurinburg, the College has played a vital role in the life of the county since its opening.